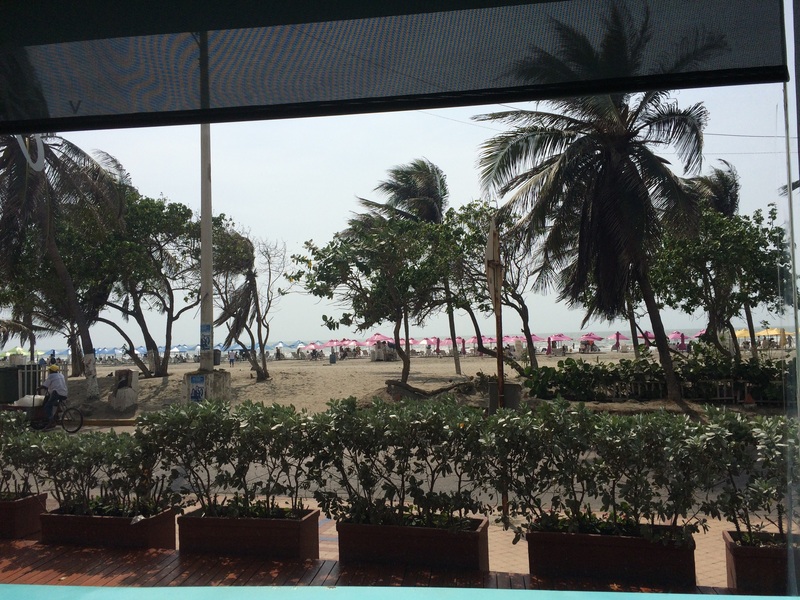 After the pure insanity of the previous night/morning, I knew I needed to downshift considerably for my final day in Cartagena. 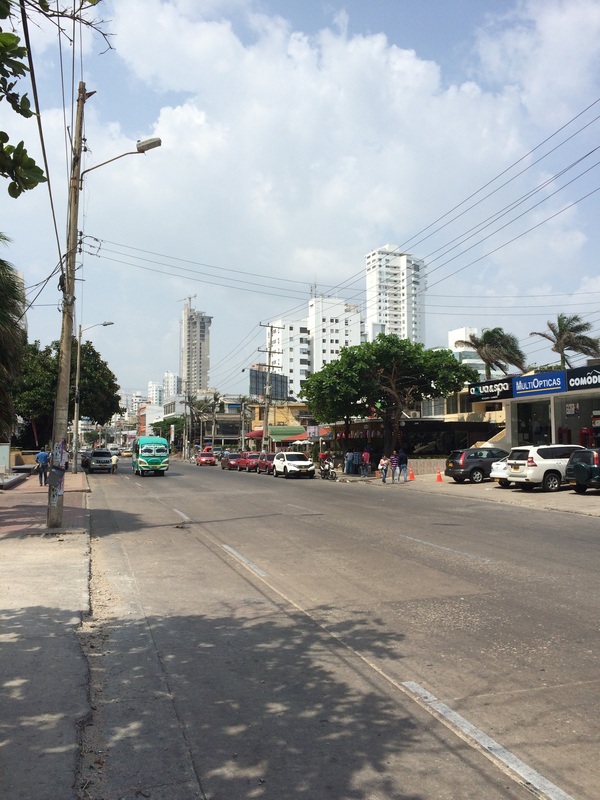 I had yet to check out the Bocagrande area so I hopped in a cab and took the 15 minute ride past the walled city to this newer part of the city, dotted with tall buildings and casinos. 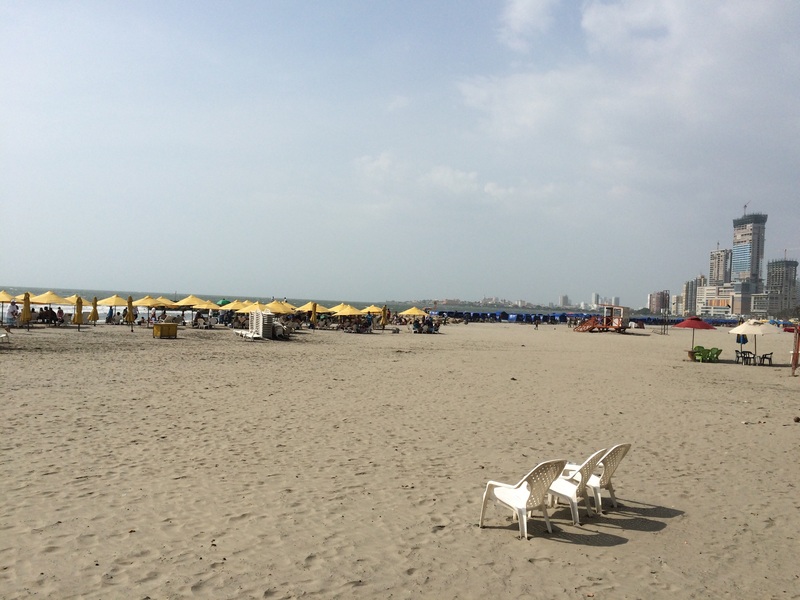 Bocagrande is also where the main beach of Cartagena is located so I picked a small sushi spot I had been told was good, which was right across the street from the beach. 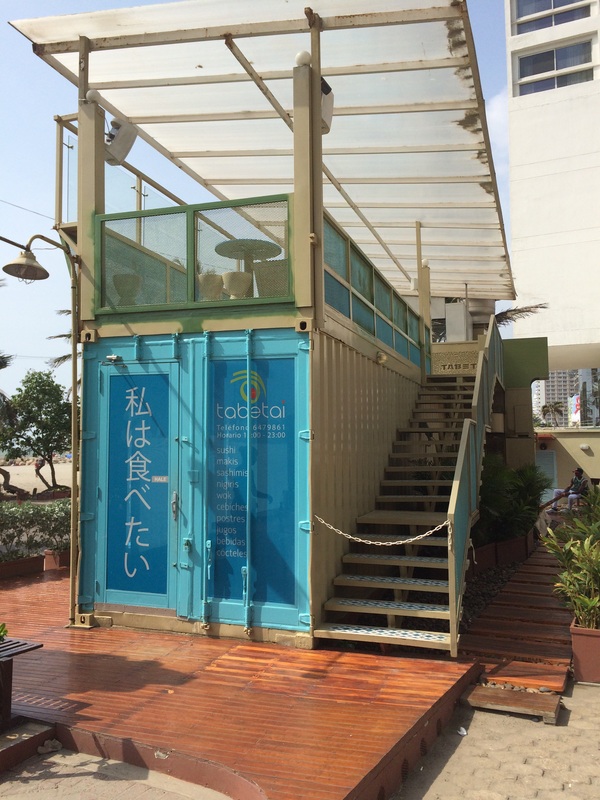 Taketai had been built from shipping containers and as soon as I approached it, this was all too obvious. The upstairs deck was unfortunately closed so I took a seat inside, which was thankfully had A/C as it was very hot and steamy without the sea breeze. The view wasn’t bad either. 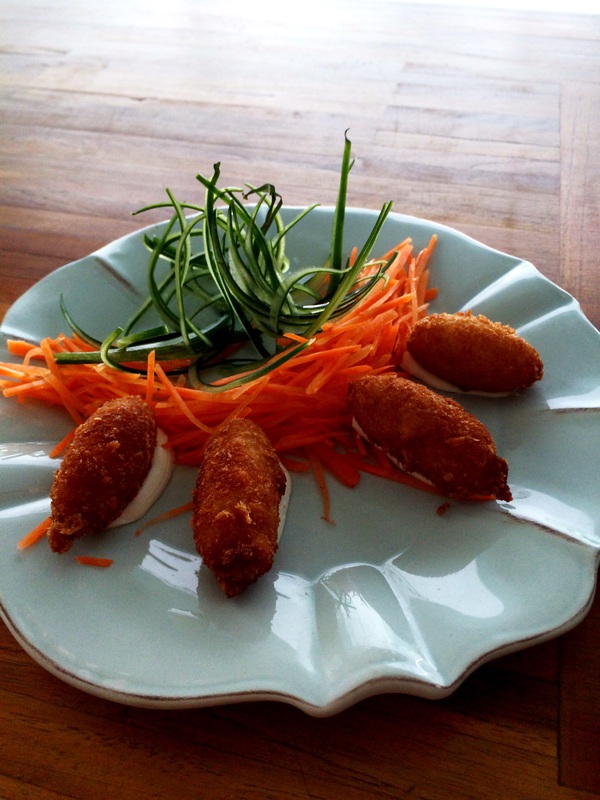 To start, I ordered the crab croquettes, which arrived after a mere few minutes. Though small, they had a generous portion of crab meat inside and were quite tasty. While trying to decide what to get next, I ordered a large glass of “limonada tradicional”, which was basically iced lemonade. My thirst quenched but not wanting to have something too heavy, I opted for the fresh salmon sashimi, given how good the seafood had been in Cartagena. And once again, it was very fresh, delicious seafood. 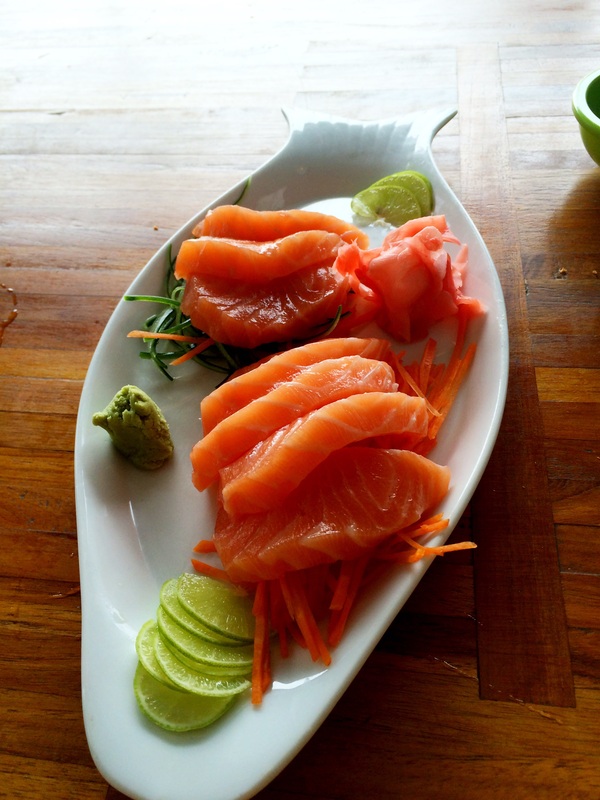 The salmon was buttery smooth and was just what I needed after several large meals plus one to come later that night. After lunch, I took a walk down the beach, avoiding various hawkers and enjoying the now steady sea breeze. Since it was Sunday, there were a lot of people at the beach and almost chair/umbrella combo was taken. After awhile, I had my fill and took a cab back to my apartment. 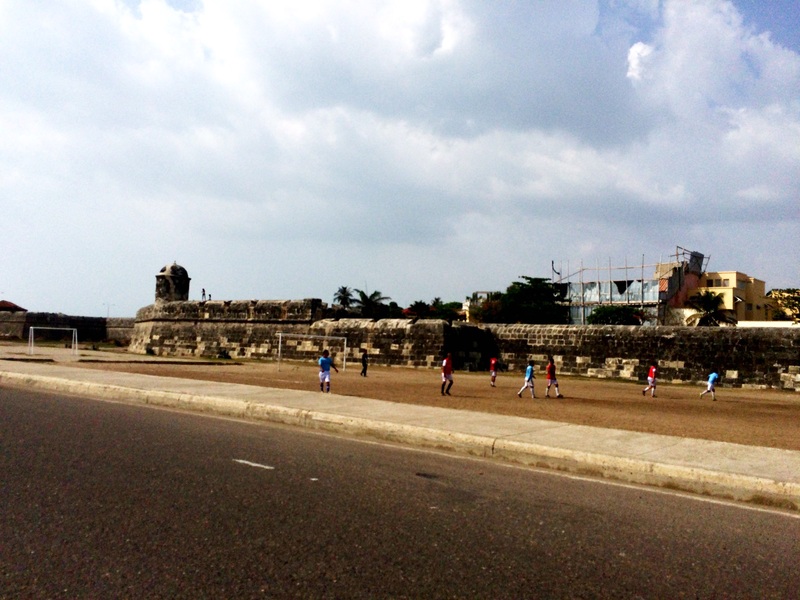 Along the way, I passed the large Colombian Naval Station and a soccer match right in front of the wall. 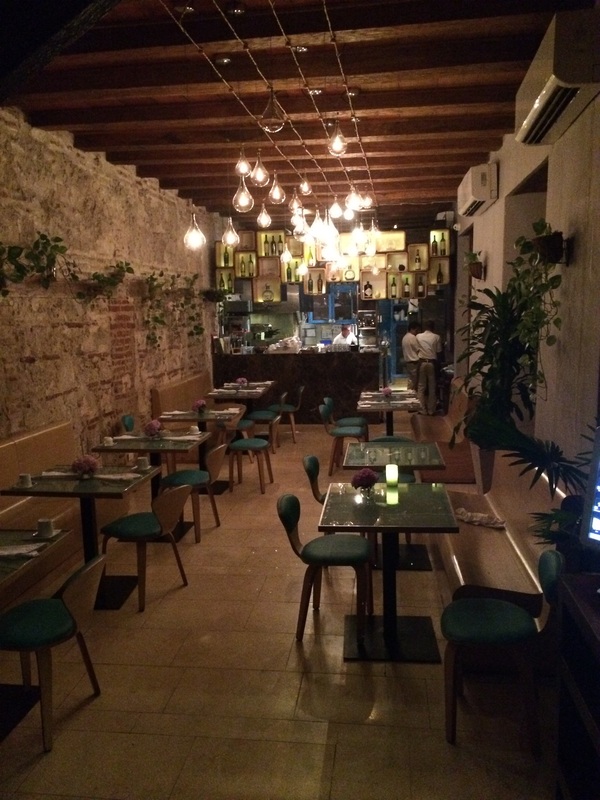 After enjoying my last real time on my great deck, including writing the last blog post and my last siesta al fresco, it was time to head out for one last meal in Cartagena. Carmen, inside the Anada Hotel, which was a former convent, had been recommended to me by several people, and I was intrigued by their 5 course tasting menu with wine pairings. That pic was after my meal but I had forgotten to get one of the restaurant beforehand. When I arrived, it was completely full so I was lucky to get the last table since I didn’t have a reservation. 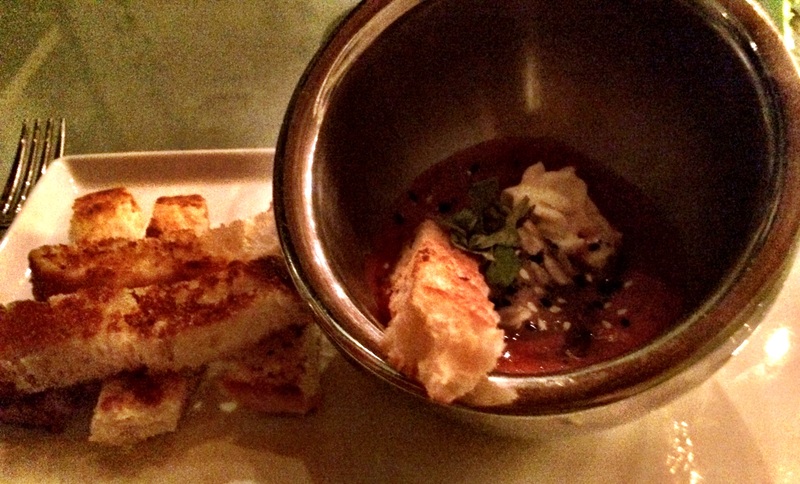 Soon after I sat down, the first amuse arrived: a traditional ceviche with sea bass and leche de tigre. Very refreshing. 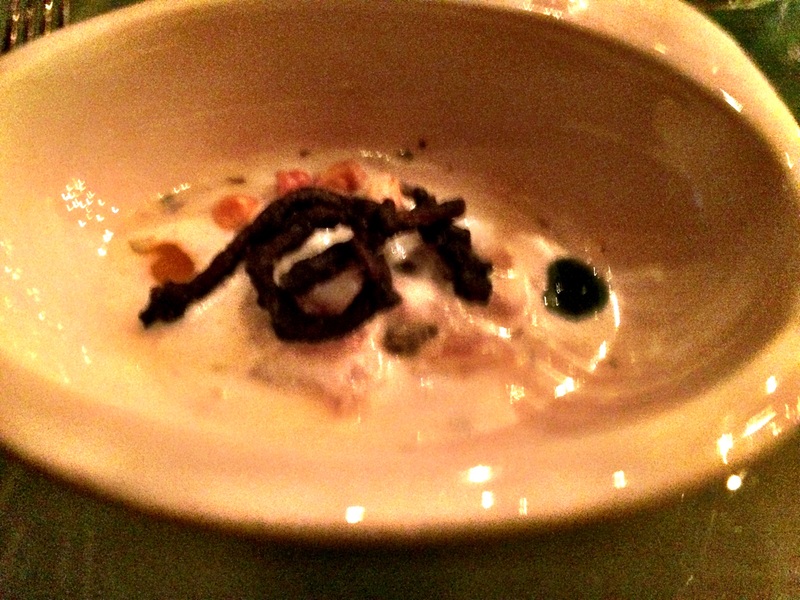 The second amuse was a real winner. The egg was filled with one piece each of shrimp, squid and langoustine with a squid ink sauce and topped with camembert cheese, delicious. The first course arrived a few minutes later along with the first wine pairing, a Chilean Chardonnay. 12 hour cooked octopus with 3 onion sauce and potatoes. This dish reminded me a lot of Peru, especially with the potatoes. 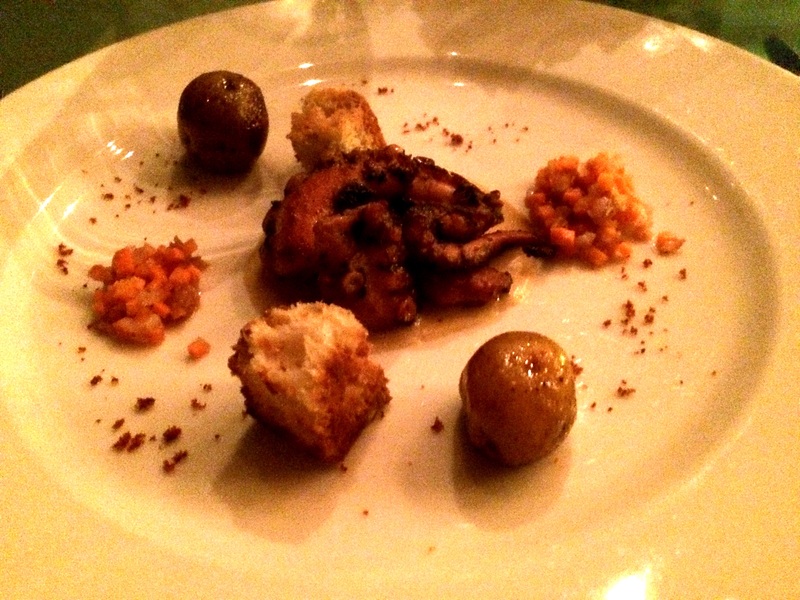 The octopus was wonderfully tender and the 3 onion sauce was delicious too. A real winner. 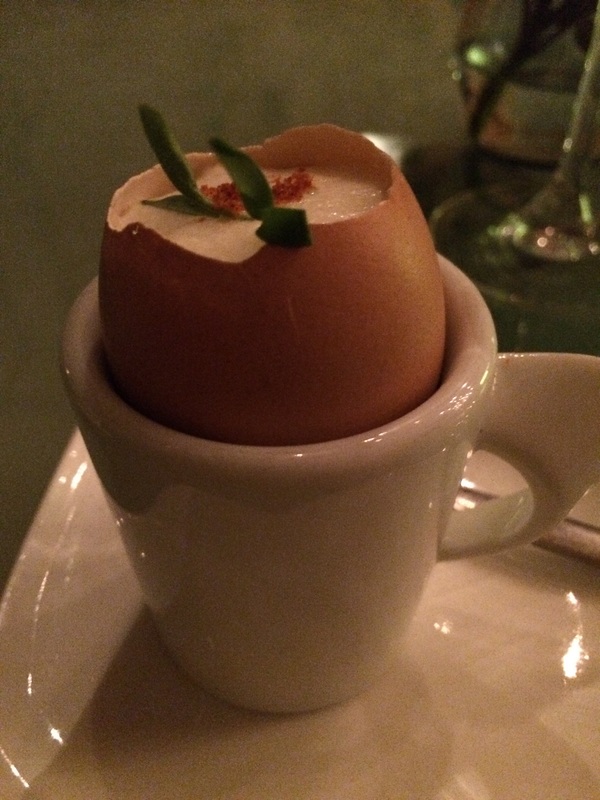 The second course was quite unlike anything I had tasted. Essentially a play on a gazpacho, it was a cold soup made with a local fruit called corozo, which tasted like a sweeter cranberry. What really made it exceptional though were the bread dipping sticks that I was encouraged to use as my eating utensil. Very creative. It was served with a rose, which made sense. 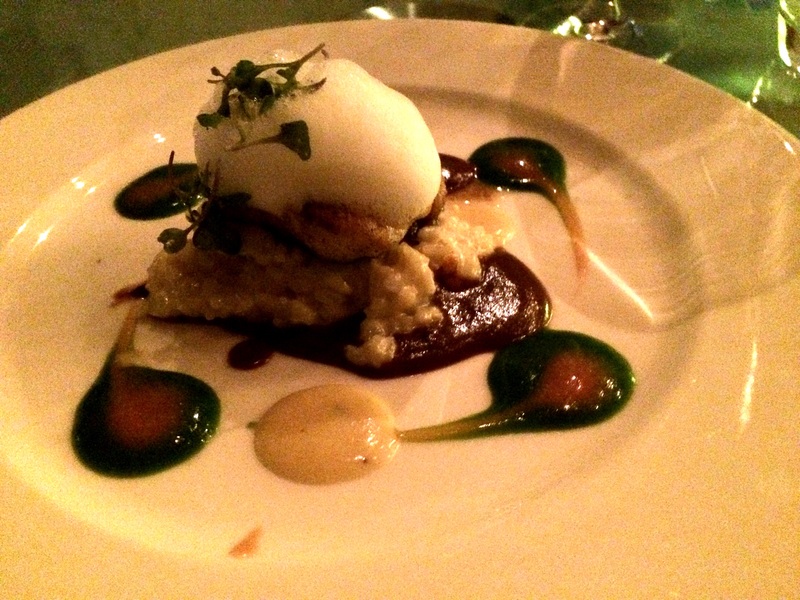 The third course was by far my favorite – grilled sea bass on a bed of coconut risotto (!) with lemon cream sauce. This was outstanding. The filet was perfectly cooked and the risotto was fantastic. I ate every single morsel of it. It was paired with another chardonnay but from Argentina this time. 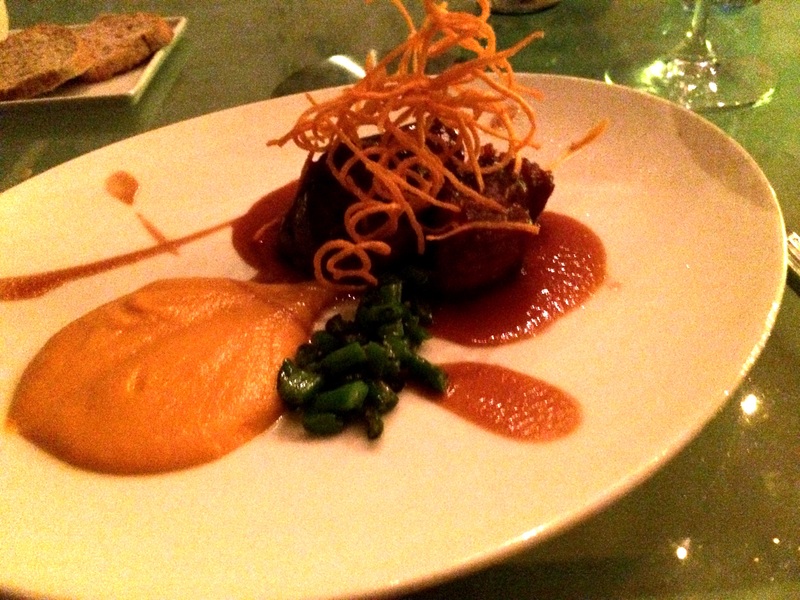 The last savory course was pork two ways – tenderloin and shredded with a tamarind sauce. During this course, I had started chatting with the couple next to me from San Francisco, who had ordered this ala carte and were telling me how good it was. Not quite the level of the last course, it was still very good, especially the tenderloin, which was perfectly cooked. It was served with, finally!, a nice Argentine Malbec. 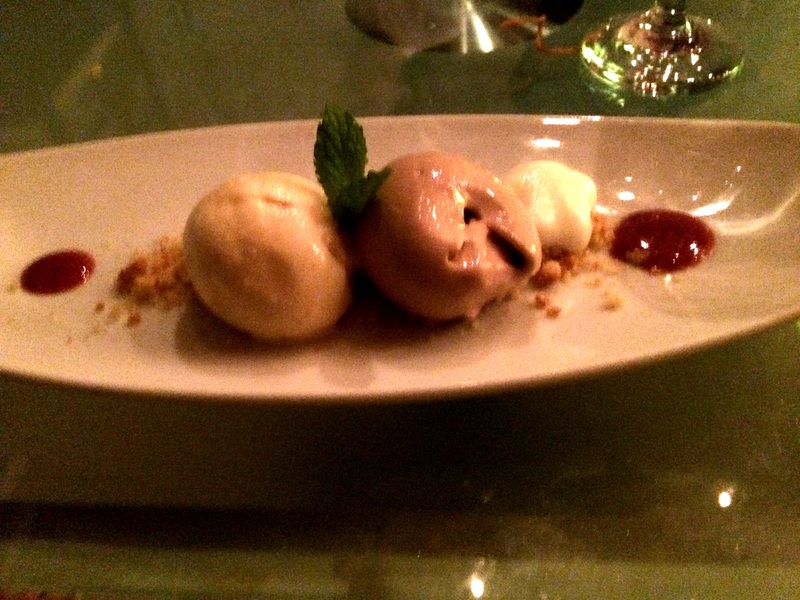 The final course was a duo of homemade ice creams. One was chocolate with mint, honey and uh, something else. For some reason, although most everyone else at the restaurant were foreign and therefore servers were speaking to in English, every dish in my case had been presented en espanol. So that combined with the 4 glasses of wine prior to this, made the final translation go a bit awry. It was quite good though. I staggered away from my table, said my goodbyes to the SF couple and walked through the beautiful hotel to get a cab. En route, I saw hotel personnel knock on the door of a room to the surprise of the flustered male occupant. He was told that they needed the ID of the senorita who had just joined him in the room and that she would be an extra $100. He distractedly said “just put it on my bill” and closed the door. I could smell her perfume from quite a bit away once he slammed the door. That I thought was the perfect note to go out on for the evening so I hailed a cab and went home. 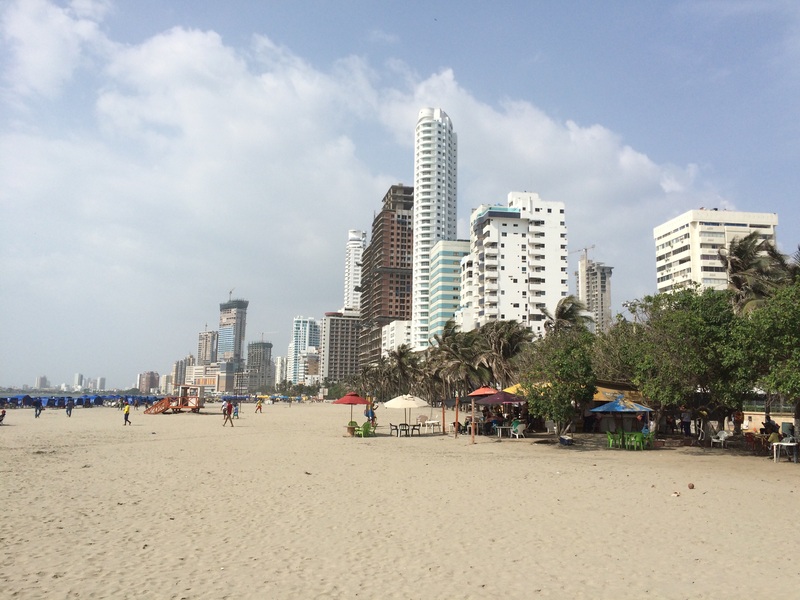 I had an early flight to Panama City so sadly that was pretty much the end of my wonderful adventures in Cartagena. Posted on May 26, 2015 by reyalto. Bookmark the permalink.